He was shot in the back, the ultimate act of treachery. On Sept. 3, 2018, a U.S Army sergeant major was killed by two Afghan police officers — the very people his unit, the new Security Force Assistance Brigade, was there to train. It was the second fatal “insider attack,” as such incidents are regularly called, this year and the 102nd since the start of the Afghan War 17 long years ago. Such attacks are sometimes termed “green-on-blue” incidents, as in Army lingo, “green” forces are U.S. allies and “blue” forces are Americans. For obvious reasons, they are highly destructive to the military mission of training and advising local military and security forces in Afghanistan. Such attacks, not surprisingly, sow distrust and fear, creating distance between Western troops and their supposed Afghan partners. Reading about this latest tragic victim of Washington’s war in Afghanistan, the seventh American death this year and 2,416th since 2001, I got to thinking about those insider attacks and the bigger story that they embodied. Considered a certain way, U.S. policy across the Greater Middle East has, in fact, produced one insider attack after another. Short-term thinking, expedience, and a lack of strategic caution or direction has led Washington to train, fund, and support group after group that, soon enough, turned its guns on American soldiers and civilians. It’s a long, sordid tale that stretches back decades — and one that, unlike the individual instances of treachery that kill or maim American servicemen, receives next to no attention. It’s worth thinking about, though, because if U.S. policies had been radically different, such green-on-blue incidents might never have occurred. In 1979, the Washington foreign policy elite saw everything through the prism of a possible existential Cold War clash between the United States and the Soviet Union. Such a focus tended to erase local context, nuance, and complexity, leading the United States to back a range of nefarious actors as long as they were allies in the struggle against communism. So in December 1979, when the Soviet Union invaded neighboring Afghanistan, Washington knew just what to do. With the help of the Saudis and the Pakistanis, the CIA financed, trained and armed — eventually with sophisticated anti-aircraft Stinger missiles, among other weapons — a range of anti-Soviet militias. And it worked! Eight years later, having suffered more than 10,000 combat deaths in its own version of Vietnam, the Red Army left Afghanistan in defeat. And, soon after, the Soviet Union itself imploded. The problem was that many of those anti-Communist Afghans were also fiercely Islamist, often extreme in their views, and ultimately anti-Western as well as anti-Soviet — and among them, as you undoubtedly remember, was a youthful Saudi by the name of Osama bin Laden. It was, then, an easy-to-overlook reality. After all, the Islamist mujahideen were astute enough to fight one enemy at a time and knew where their proverbial bread was being buttered. As long as the money and arms kept flowing in and the more immediate Soviet threat loomed, even the most extreme of them were willing to play nice with Americans. It was a marriage of convenience. Few in Washington bothered to ask what they would do with all those guns once the Soviets left town. Recent scholarship and newly opened Russian archives suggest that the Soviet invasion of Afghanistan was driven as much by defensiveness and insecurity as by any notion of triumphal regional conquest. Despite the fears of officials in the administrations of presidents Jimmy Carter and Ronald Reagan, the Soviets never had the capacity or the intent to march through Afghanistan and seize the oil fields of the Persian Gulf. Like so much Cold War-era thinking, this was pure fantasy and the meddling that went with it anything but necessary. After the Soviet exit, Afghanistan fell into a long period of chaos, as various mujahideen leaders became local warlords, fought with one another, and terrorized average Afghans. Frustrated by their venality, former mujahideen, aided by students radicalized in madrassas in Pakistani refugee camps — schools that had often been financed by America’s stalwart partner, Saudi Arabia — formed the Taliban movement. Many of its leaders and soldiers had once been funded and armed by the CIA. By 1996, it had swept to power in most of the country, implementing a reign of Islamist terror. Still, that movement was broadly popular in its early years for bringing order to chaos and misery. And let’s not forget one other small but influential mujahideen group that the United States had backed. The “Afghan Arabs,” as they were called — fiercely Islamist foreigners who flocked to that country to fight the godless Soviets. The most notable among them was, of course, bin Laden — and the rest, as they say, is history. Bin Laden and other Afghan War veterans would form Al Qaeda, bomb American embassies in Kenya and Tanzania in 1998, blow up the USS Cole in Yemen in 2000, and take down the Twin Towers and part of the Pentagon on Sept. 11, 2001. These, though, were only the most well known acts of those anti-Soviet war vets. Thousands of Afghan Arabs left that war zone and returned to their own countries with plenty of zeal and fight still in them. Those veterans would then form local terror organizations that would challenge or help destabilize secular governments in the Middle East and North Africa. Still, it’s worth reflecting on America’s complicity in its own 9/11 devastation. In a strange fashion, given Washington’s history in Afghanistan, 9/11 could be seen as the most devastating insider attack of all. The 2003 invasion of Iraq — Operation Iraqi Freedom as it was optimistically named — may go down as one of the more foolish wars in American history — and many of the attacks on U.S. troops that followed from it over the years might be considered green-on-blue ones. After all, Washington would, in the end, train and back so many diffuse groups that a number of the members of various terror and insurgent outfits were once on the U.S. payroll. It began, of course, with Saddam Hussein, the brutal Iraqi dictator whom the American people would be assured — in 1990 and again in 2003 — was the “next Hitler.” In the 1980s, however, the U.S. government had backed him in his invasion of Iran — then as now considered a mortal enemy — and the eight-year stalemated war that followed. The United States even gave his forces crucial targeting intelligence for the use of his chemical weapons against Iranian troop formations, embittering the Iranians for years to come. The Reagan administration also took Iraq off the State Department’s list of state sponsors of terror and even allowed the sale of components vital to Saddam’s production of those chemical weapons. Nearly a million people died in that grim war and then, just two years after it ended, the United States found that, for its efforts, Hussein would send his troops into neighboring Kuwait and threaten to roll over America’s key ally in the region, Saudi Arabia. 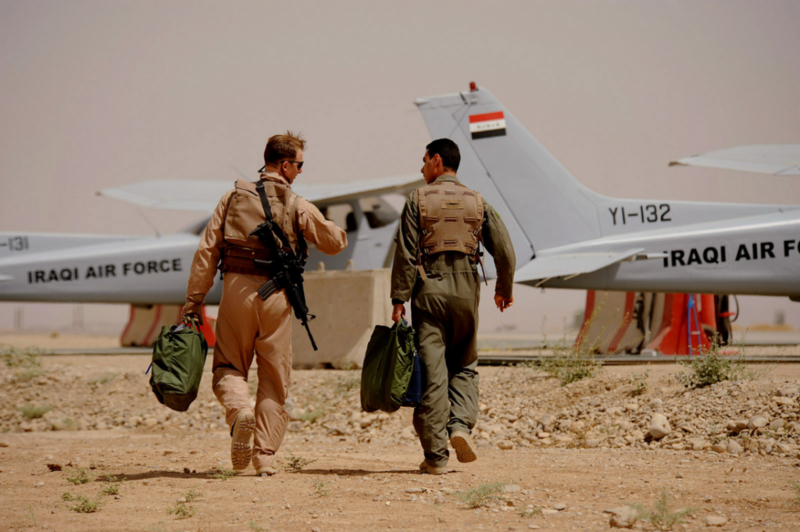 That, of course, kicked off another major Iraqi conflagration, again involving Washington. The first Persian Gulf War. At the end of that “victory,” Pres. George H.W. Bush encouraged Iraq’s oppressed Shia and Kurdish populations to rise up and overthrow Hussein’s largely Sunni regime. And rebel they did until, bereft of the slightest meaningful support from Washington, they were defeated and massacred. More than a decade later, in 2003, when the United States again invaded Iraq — this time under the false pretense that Saddam had weapons of mass destruction — Americans were assured that most civilians, especially the embattled Shia majority, would cheer the arrival of Uncle Sam’s military machine. In reality, it took less then a year for Shia militias to form and begin openly attacking U.S. troops with a helping hand later from the Iranians, who had their own bitter American legacy to recall. You see, those Shia — unlike most Americans — still remembered how Washington had betrayed them in 1991 and so launched their own versions of insider attacks on U.S. soldiers. However, from 2003 to 2007 — including the period when I served as part of the U.S. occupation force in Baghdad — the main threat came from Sunni insurgents. They were a diverse lot, including former Saddam loyalists and military officers, whom the United States had thrown out onto the street when it disbanded his army — Islamist jihadis, and Iraqi nationalists who simply opposed a foreign occupation of their country. As Iraq fell into chaos — I was there to see it happen — Washington turned to a savior general, David Petraeus, armed with a plan to “surge” U.S. troops into key Sunni regions and lower the violence there before Democrats in Congress lost patience and started calling for an end to the American role in that country. In the years that followed, the statistics seemed to vindicate the Petraeus “miracle.” Using divide-and-conquer tactics, he paid off the tribal leaders, who became known as the “Sunni Awakening” movement, to turn their guns on more Islamist-focused Sunni groups. Many of his new allies had only recently been insurgents with American blood on their hands. Still, the gamble seemed to work — until it didn’t. In 2011, after the Obama administration withdrew most American troops from the country, the Shia-dominated and U.S.-backed government in Baghdad failed to continue to pay the “awakened” Sunnis or integrate them into the official security forces. I’m sure you can guess what happened next. Sunni grievances led to mass protests, which led to a Shia crackdown, which led to the explosion of a new insurgent terror group.Islamic State, or ISIS, whose origins — talk about “insider” — can be traced back to the inspiration of Al Qaeda and to a group initially known as Al Qaeda in Iraq. In fact, it was a dirty secret that many of the Awakening veterans either joined or tacitly supported ISIS in 2013 or thereafter, seeing that brutal group as the best bet for protecting Sunni power from Shia chauvinism and American deceit. Soon enough, the U.S. military was back in action in response to ISIS conquests that included some of Iraq’s major cities. And if all of that doesn’t qualify as a tale of blowback, what does? 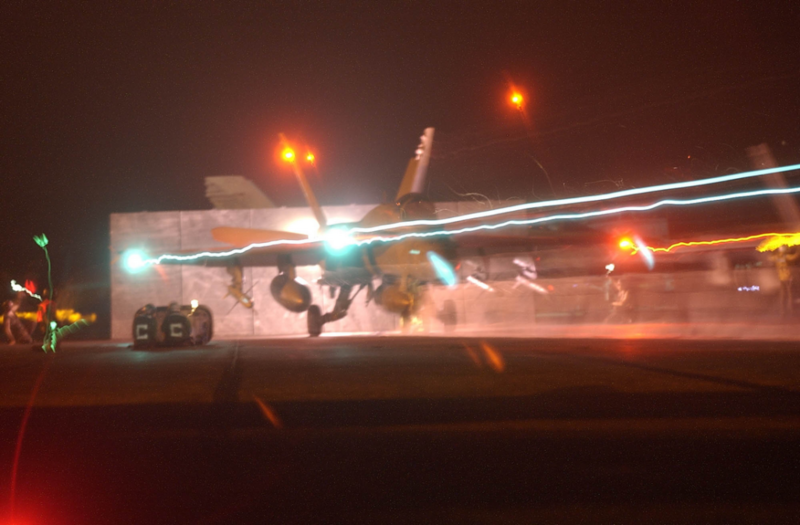 An F/A-18 Hornet launches from one of four steam driven catapults on the flight deck of USS Constellation during night operations in 2003. U.S. Navy photo by Photographer’s Mate 2nd Class Felix Garza, Jr.
Syria is a humanitarian disaster area and no U.S. administration has demonstrated anything resembling a coherent or consistent strategy when it comes to that country. Torn between Iraq War fatigue and military overstretch, the Obama team waffled on what its policy there should even be and ultimately failed to achieve anything of substance — except to potentially sow the seeds for future insider attacks. Indeed, a paltry yet startlingly expensive CIA attempt to arm “moderate” rebels opposed to the regime of Syrian strongman Bashar Al Assad turned out to be wholly counterproductive. Some of those arms were ultimately reported to have made their way into the hands of extremist groups such as the Al Nusra Front, an Al-Qaeda franchise in Syria. In a situation where truth proved more farcical than fiction, the $500 million effort to train anti-ISIS rebels managed to train “four or five” of them, according to the top U.S. military commander overseeing the Syrian effort. In Yemen, in a Saudi-led war in which the U.S. has been shamelessly complicit, a brutal bombing campaign waged largely against civilians and a blockade of rebel ports have undoubtedly sown the seeds for future insider attacks. Beyond the staggering humanitarian toll — a minimum of 10,000 civilian deaths, mass starvation, and the outbreak of the world’s worst cholera epidemic in modern memory — there is already strategic blowback that could harm future American security. As the U.S. military provides in-flight refueling of Saudi planes, smart bombs for them to drop, and vital intelligence, it is also undoubtedly helping its future enemies. The chaos, violence, and ungoverned spaces that war has created are, for instance, empowering the Al-Qaeda franchise there, Al Qaeda in the Arabian Peninsula, one of the most active and dangerous jihadist crews around. When, however, AQAP inevitably succeeds in some future strike aimed at Americans or their property, precious few pundits and policymakers will call it by its proper name: an insider attack. So, as we lament the death of yet another soldier in a green-on-blue strike in Afghanistan, it’s worth thinking about the broader contours of U.S. policy across the Greater Middle East and Africa in these years. Is anything the United States doing, anyone it is empowering or arming, likely to make the Middle East or America any safer? If not, wouldn’t a different, less interventionist approach be the essence of sober strategy? It may, of course, be too late. Washington’s military policies since 9/11 have alienated tens of millions of Muslims across the Greater Middle East and elsewhere. Grievances are gestating, plots unfolding, and new terror outfits gaining recruits due to the very presence of the U.S. military, its air power, and the CIA’s drone force in a “war” that is about to enter its 18th year. Seen in this light, it’s hard not to believe that more anti-U.S. “insider” attacks aren’t on the way. The question is only where and when, not if. Maj. Danny Sjursen is a U.S. Army strategist and former history instructor at West Point. He served tours with reconnaissance units in Iraq and Afghanistan. He has written a memoir and critical analysis of the Iraq War, Ghost Riders of Baghdad: Soldiers, Civilians and the Myth of the Surge. He lives with his wife and four sons near Fort Leavenworth, Kansas. Follow him on Twitter at @SkepticalVet. The views expressed in this article are those of the author, expressed in an unofficial capacity, and do not reflect the official policy or position of the Department of the Army, the Department of Defense or the U.S. government. This story originally appeared at TomDispatch.